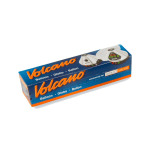 10 ft of replacement Balloon Material for your Volcano Vaporizer with Solid Valve. Cut it to your preferred size. NOT COMPATIBLE WITH VOLCANO WITH EASY VALVE.